Shortly after 9/11, designer Ismael Quintero spotted a fire hydrant lid on the sidewalk that gave him the inspiration for this poetic Odyssey lamp. Made from recycled green beer bottles and embossed with the phrase “Nostri Lumen Est Una” which means “our light is one,” the lamp was designed to help people remember that tragic day while at the same time healing from it. The Odyssey is one of the finalists in our Bright Ideas Design Competition – if you like it, vote it up! Shortly after 9/11, designer Ismael Quintero spotted a fire hydrant lid on the sidewalk that gave him the inspiration for this poetic Odyssey lamp. 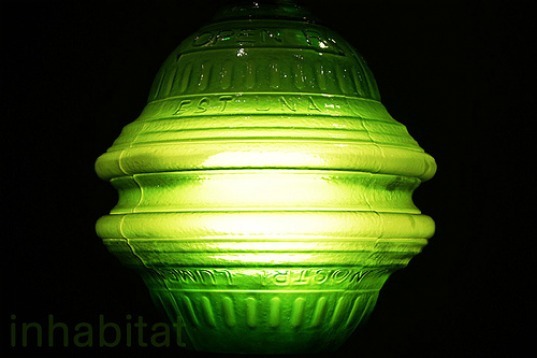 Made from recycled green beer bottles and embossed with the phrase "Nostri Lumen Est Una" which means "our light is one," the lamp was designed to help people remember that tragic day while at the same time healing from it. The Odyssey is one of the finalists in our Bright Ideas Design Competition - if you like it, vote it up!